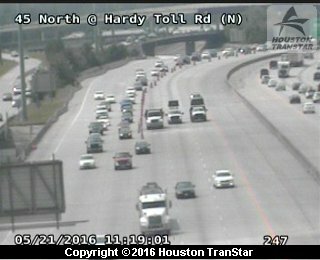 Spring, Texas – May 21st 2016: Emergency roadwork on Interstate 45 just north of the Hardy Toll Road continues as TxDOT crews repair a large pot hole in the mainlanes. TxDOT shut down three of the northbound mainlanes yesterday morning around 11am due to a large pothole on the freeway. Crews attempted to repair the roadway with an asphalt mix, however this method failed. TxDOT had to cut out a section of the roadway and fill it with concrete which takes much longer to set than the emergency asphalt mix. TxDOT says the closure may remain in place until 4PM Saturday. This closure is causing major delays as folks try and make their way north on I45. Use an alternate route like Kuykendahl or Gosling to avoid this bottleneck.